Dieses Cottage ist neu und geräumig und bietet einen fantastischen Blick auf das Meer und die Küste! Das Hotel liegt an der Westseite der Big Island von Hawaii, direkt über Kailua-Kona, auf der Seite des Mt. Hualalai, in Holualoa, mit einem atemberaubenden Blick auf das Meer und die Küste! Unser neues, maßgeschneidertes Studio-Ferienhaus ist ca. 500 m² groß und bietet eine schöne breite Veranda und einen fantastischen Meerblick. Die kühle Höhe unserer Hütte ist 1400 ft. Mit einer schönen Aussicht auf die Küste über Honokohau Harbour. Die Sonnenuntergänge, die wir genießen können, sind unglaublich! Holualoa Stadt selbst, ist jetzt ein kleines malerisches Kunstdorf und eine klassische alte kleine hawaiianische Stadt mit viel Geschichte. Holualoa Bereich ist eine sehr bevorzugte Gegend zu bleiben und zu leben wegen der kühleren Temperaturen, Kona Kaffeeland rundherum, und es ist in unmittelbarer Nähe zur Stadt. Wir lieben Holualoa und wissen es auch! Badezimmer mit Dusche, Waschtisch und Stapel Waschmaschine und Trockner. Wir begrüßen unsere Gäste mit Obst, Kaffee und halb und halb. Wir hinterlassen auch ein oder zwei Leckereien für Ihren ersten Morgen. Lovely place with all the amenities. Great view, private, we'll equipped, and wonderful hosts. Book it - you'll be happy you did. We loved the cottage. Stayed 2 nights in Feb 2019. Clean, well equipped, everything just right. It’s quiet, all you hear is birds and frogs. Beautiful views. It rains up on the hill more often than in Kona, but not a problem—jump in the car and the beaches are all sunny. Would happily come back for a longer stay. Highly recommend the cottage! Immaculate and Comfortable Cottage, nicely appointed, great location, great hosts! Stackable washer/dryer in bath which was handy and worked well. The cottage is pristine. Extremely clean and no bugs whatsoever. The section of the highway where this is located is handy to town - and because it's near the north end, it's also closer to the beaches. I've stayed in various places along this corridor over the years and I like the area because it's cool at night. Bring jammies and a light sweater for evening. I really enjoyed my stay here, it was easy to find, just a beautiful and pleasant place to be, and very important to me, so very clean and well cared for. With excellent hosts! I would stay here again in a heartbeat. Mahalo for the hospitality! This is our second time to this amazing cottage. It is perfect for solo/couple travelers. The porch views are gorgeous with sunset views of the Kona coast. Highly recommend this cottage! Also super close to the Kona coffee farms. I have nothing but good things to say about Berta and Billy’s property. Communication was excellent, the cottage itself immaculate and well presented..... goodies on arrival, and I love the unfussy but very comfortable furnishings. Bed gave us a wonderful sleep. It is a little out of the way, but the view and privacy was well worth it. We would stay again in a heartbeat, and I have no hesitation in recommending this fabulous property. Thank you...but just want to let others know that actually our location in so so convenient and close to everything! You are right up the hill from everything! 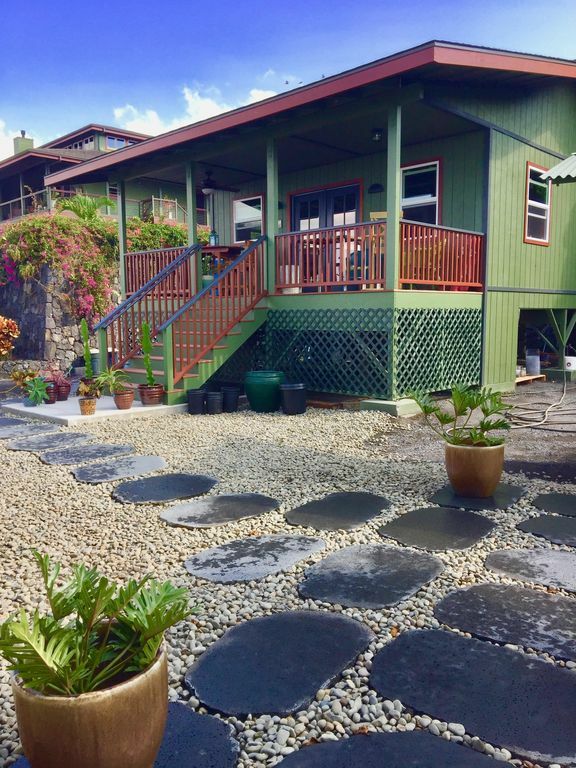 10 minutes to shopping, 15 to Kona town and the beach, 20 to the airport, plus easy access to the north end of the island, or saddle road to go the east side, Hilo, Volcano, etc. You couldn't be in a better location! Yes, just cool enough for the best sleeping climate too. Holualoa Cottage is a private oasis that was simply perfect for my wife and I. Located just minutes up the hill from Kona town, it’s super convenient to everything from shopping to restaurants to beaches, yet far enough from the bustle to be an utterly peaceful and relaxing retreat. Situated at an altitude of 1500 feet, it offers respite from the heat of the day, excellent sleeping temps at night, and lovely coastal views. The online photos provide a very accurate representation of the cottage— it’s impeccably clean and simply charming. Thank you Berta and Billy! Unsere Hütte Lage ist super bequem zu erreichen Innenstadt, oder reisen entlang der oberen Berg Autobahn, oder nach Norden nach Waimea, oder die Sattelstraße nach Hilo. Wir sind nur wenige Minuten entfernt von Einkaufsmöglichkeiten, Strände, Spaziergänge durch die Stadt oder entlang der Küste an ein paar unserer Parks.